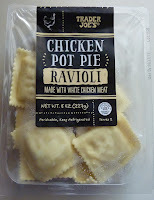 TJ's has done Chicken Pot Pie before, but never quite like this. In the past, we've seen them offer us Bites (please do not read that review) and quite recently, we sampled a delicious British/East Indian pot pie of sorts. As Russ reminded us, it wasn't all that good-for-you. 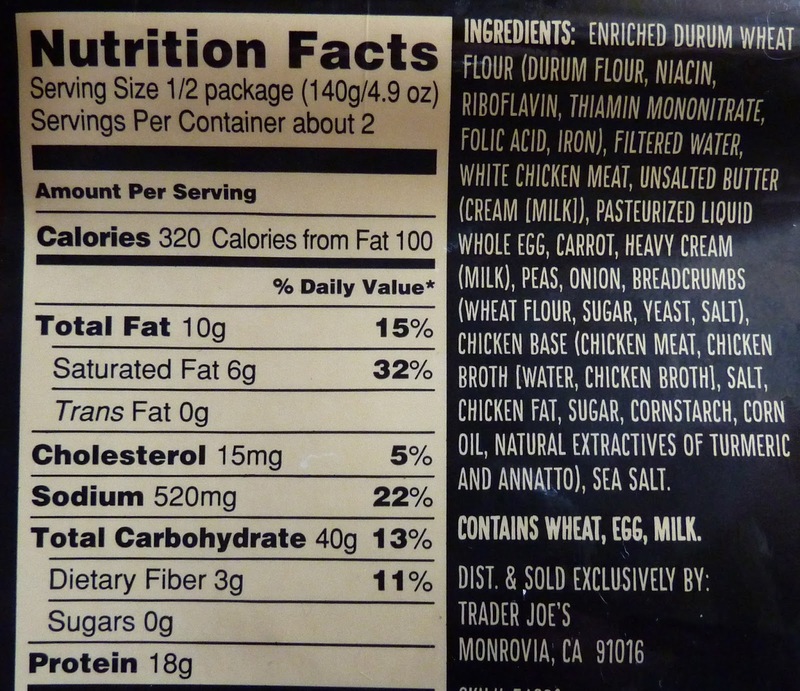 But let's face it, when a dish has more than a whole day's worth of saturated fat in a single serving, it's never the nutrition facts that are going to redeem the dish—it's that rich, delicious flavor. 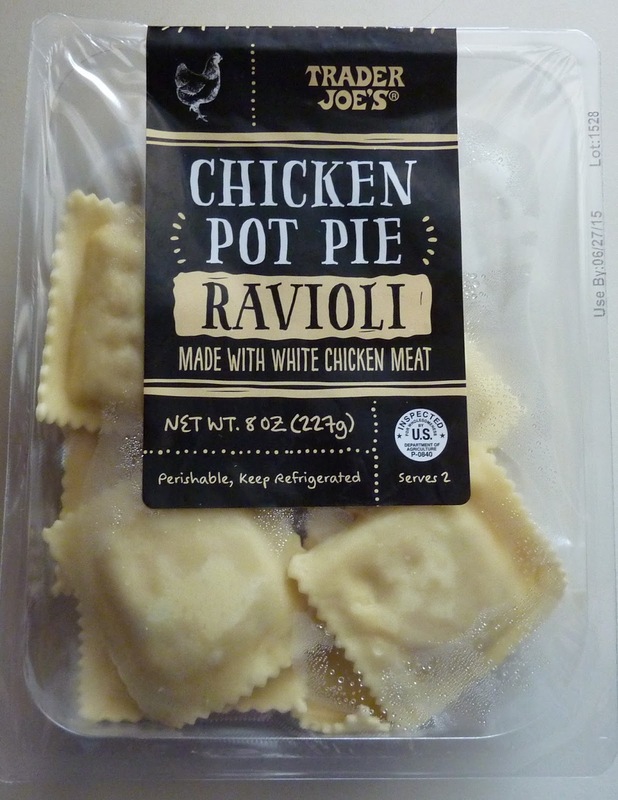 When Sonia and I found out they stuck chicken pot pie in raviolis, we started arguing about what sauce to use, if any, before we even saw the package at the store. Sonia was leaning toward a white Alfredo type sauce, while I was thinking a traditional marinara might work. Turns out we were both wrong. This pasta works best with nothing but a little olive oil. Reader Haley suggests butter, rosemary, thyme, and grated parmesan on top. We'll have to try that next time, Haley. Thanks for the tip! Any other serving suggestions are welcome in the comments section below. Sonia found herself wishing for more chicken inside the pasta, but still really enjoyed the flavor overall. I agree. It's a hearty, all-American type taste wrapped up in little raviolis. Very unique. It's about $4 for a two-serving package. Four stars from Sonia and three and a half from me. Maybe fry them up to give it a crispy texture. Then top off with a cream gravy. how about dipping them in panko then frying them? a little texture never hurts.. haven't noticed these yet... seems a bit out there. I bet that would be awesome, KBF! Thank you for the mention, but it was an easy option because butter is delicious. ;) going to have to try those this week. Marinara sauce would be the LAST type of sauce I'd put on these/ What were you thinking? Alfredo could work. Butter/oil sounds great. As does frying. Also lovely with vegetables (I did peas, zucchini and julienned carrots) and some fresh tarragon and parsley sautéed in either butter or olive oil (or both!) and then topped with a little grated Parmigiano-Reggiano. Or a little crumbled bacon, because why not? I did these in chicken soup and the second time around I fried them up. Delicious! I tried these and they were delicious! I made a chicken pot pie-ish béchamel sauce (not a lot though) but next time I'll try the panko and deep fry suggestion, thanks! Wish the quantity was larger because I have 6 in my crew but otherwise I will be purchasing this again. I fried it with olive oil and some butter. It was good, but I don't think it was good enough to buy it again. I saw this today and was curious about it, but figured I would read your review first before taking the plunge. 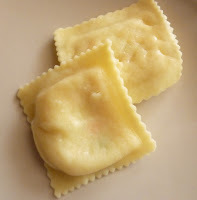 Also, I haven't found it on the blog yet, but have you guys gotten around to trying the lemon ricotta ravioli? I would love to read your opinion. 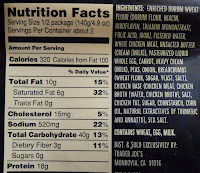 Lemon ricotta ravioli...don't think I've heard of that before, but we'll def look for it on our next TJ's run. Thanks! The Lemon ricotta ravioli are amazing. I just put browned butter and some Parmesan on top. Heavy cream and butter with a little chicken stock to thin it a bit. Fresg grind plenty of black pepper. Heavenly.